The European Commission’s 3rd Health Program co-funds E-DETECT. KNCV is one of the partners in E-DETECT (early detection and integrated management of tuberculosis in Europe), a project that was recently launched at a meeting in Luxembourg. 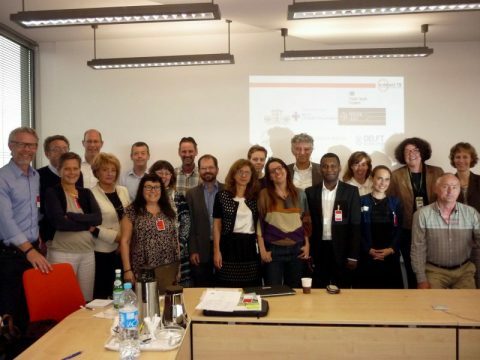 The European Commission’s 3rd Health Program co-funds E-DETECT (early detection and integrated management of tuberculosis in Europe), a project that launched at a meeting on 8th June 2016 in Luxembourg. This project will contribute to the eventual elimination of tuberculosis in the European Union by utilising evidence-based interventions to ensure early diagnosis, improve integrated care and support community and prison outreach activities in low- and high-incidence countries. The E-DETECT TB group aims to achieve this by working through their network of partners in six member states (Bulgaria, Italy, Romania, Sweden, the Netherlands and the UK). They will jointly evaluate evidence-based interventions, taking best practice approaches from countries where co-applicants have developed national strategic plans and provide a framework, in collaboration with the Directorate for Health and Food Safety (DGSANTE) and the European Centre for Disease Prevention and Control (ECDC), to support the adaptation and implementation of these measures. E-DETECT TB will prioritise migrants, homeless persons, prisoners, problem drug users and those with multi-drug resistant tuberculosis. Outreach for early diagnosis: Using a mobile x ray unit equipped with computer- aided diagnostics and molecular test to detect tuberculosis in Romania and Bulgaria, and ensure appropriate support to complete treatment. Migrant TB detection, prevention and treatment: In Italy, we will actively screen new and settled migrants for active and latent TB respectively ensuring that those testing positive are appropriately managed and generating the evidence to support future European policy. Establishing a database of latent and active TB in Europe starting with Italy, Sweden, the Netherlands and the UK to inform epidemiological analysis and future interventions to control TB. Supporting national TB programmes to develop action plans and national TB control strategies by establishing an action framework.